While at first glance, it looks like an intimidating robot, Prosthesis is actually a responsive, stable and powerful human-controlled exo-bionic platform that amplifies the motions of the pilot.Digital Trends traveled out to Elkhart, Indiana to watch “the world’s first exo-bionic racing mech” take its first steps — and it didn’t quite go like we thought it would. Prosthesis is the first machine of its kind, ushering in a new era of large scale, high-performance mech technology. It represents a departure from conventional, human scale exo-bionics, integrating off-road racing technology with industrial motion control to produce an entirely new breed of machine.read more(furrion). 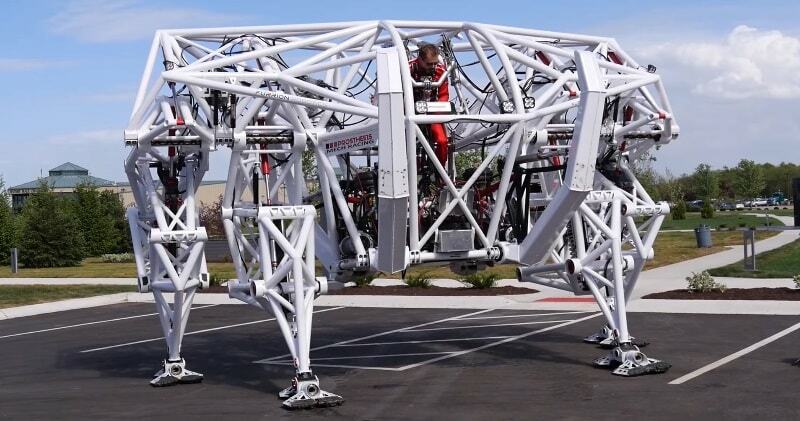 Prothesis stands at nearly 15 feet tall, 18 feet wide and weighs more than 8,000 pounds. As the flagship competitor in mech racing, Prothesis will eventually be able to run up to 21 mph, jump over obstacles and run for up to 2 hours on a single charge. The frame is made out of chromoly steel, a high-performance alloy used in sports and aerospace. Both durable and agile, it is capable of tackling any terrain.“Mech racing will be unlike anything anyone has ever seen before,” said Tippett. “We feel this is a sport whose time has come. People have been dreaming of large-scale, high performance exo-bionic machines for decades and we’re excited to have the world’s first.